SAFE AUTO SHUT OFF AND FRIENDLY MATEARIAL. "I own some humidifier but all of them have weird shape, bulky or onion shape. When I first saw this humidifier I thought it’s rechargeable. I was wrong but got it anyway. I’m glad I did. Love this medium size humidifier. Doesn’t take up much space and work quietly." "I recently starting using diffusers in my home. I was skeptical that it would make a difference in our health. I have found that it is soothing and really helps us relax. 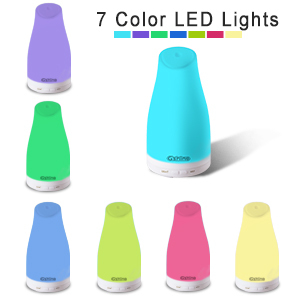 This diffuser has numerous color modes that you can choose depending on your mood. It was easy to set up, just connect the plug, add water with the included measuring cup and add a few drops of oil! This one is in my living room! Works as a perfect night light as well!!" "I almost have a diffuser in every room of the house. I think this may be my favorite because it has a much smaller footprint than my others and puts off more light. The mist also comes out higher and I can twist the top to make it point in whatever direction I want. It also came with a fill/pour cup that has measuring lines on it. This holds 100 mL and my larger one holds the same amount, so I'm not loosing any capacity with a smaller footprint. If you're looking to pick between the two I have in my photo, this is the better option, especially if you use it as a night light like I do in my kids' rooms. I put a little bit of lavender in this while we read books and say prayers and it helps my kids calm down and fall asleep - I've seen a big improvement on how quickly they fall asleep now compared to without a diffuser." "I bought this one for my hall and it is just apt for it. For now I am putting Eucalyptus oil in it so it acts as a humidifier as well as a diffuser as winter is here and I have a 2 year old in my house. The fragrance is neither too strong nor too light. The lights are soothing and all the colors are very nice. Have been using it for almost a week now and it is serving it's purpose nicely. Overall a satisfying purchase." 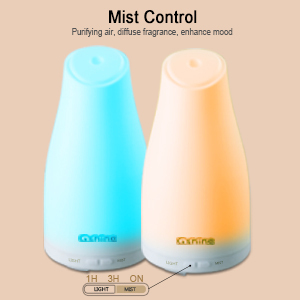 150ml Aromatherapy Ultrasonic Diffusers Adjustable Mist Mode Aroma Humidifier with 7 Color Changing LED Lamps and Auto Shut-off for Bedroom and Office. Breathe deeply. 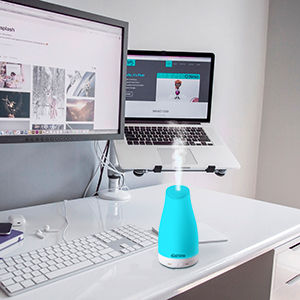 Our essential oil diffuser take you on a sensory journey that can instantly create a calming or balancing atmosphere. Every home should have an essential oil diffuser. Not only can the oils make a room smell heavenly without chemical ingredients that can harm your health, but they can actually benefit the body, mind, and soul. 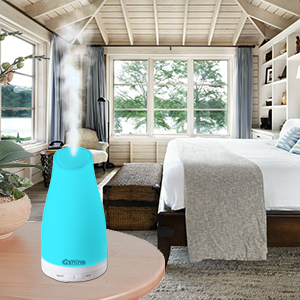 Using essential oils diffuser is an enjoyable and effective way to experience aromatherapy in your home.Diffusing cool mist,purify air,help relieve sore throat,creating a soothing environment in your bedroom or workspace. Independent light control can keep 7 colors changing or stay on one, adjust each color to be dim or bright and with your favorite essential oil, you would relieve stress and fall asleep quickly. Ultrasonic Mist Flow without any heat, which best preserves the integrity of the essential oil. Keeping the oils in their normal state as they turn into a healthfully scented mist. 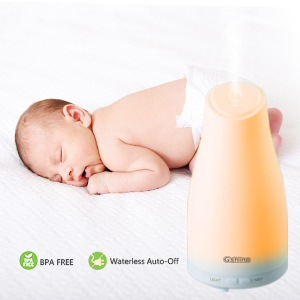 Why choose Gshine’s essential oil diffuser? Made of BPA FREE material.without smell, without noise. Improve your home’s air and atmosphere quality, sleep better at night.